Social Media has continued to grow over the last several years, with over a 1.15 billion users on Facebook, 500 million users on Google+ and Twitter, 238 million on LinkedIn, and 70 million on Pinterest. With that many users on these top 5 social media sites, there is high value in creating a profile page to be seen within this social media world. Will you be amongst the millions to invest in the social media world to make your business online presence known? Social Media allows companies to form a relationship with connected clients and provide another route to superb customer service. It also allows companies to offer promotions and provide relevant business news. In today’s business climate, participation in social media is not a choice, it is as necessary as a website. 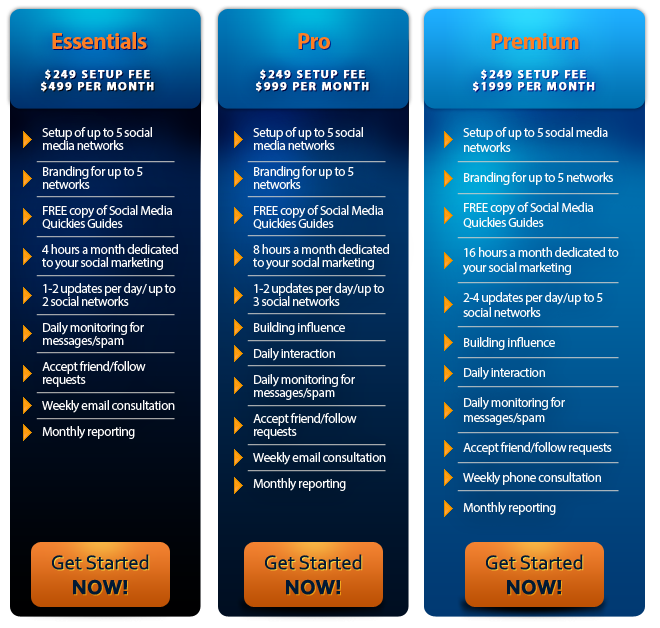 Now is the time to become a part of the most powerful forms of networking in the world. We offer both the options to learn how to use social media on your own or have us manage your social media with one of our three monthly plans. For the do it yourselfers, we offer a one time package that will teach you the basics of social media, set up your sites for you, brand your pages with graphics, and get you started with a marketing plan. Our Tucson social media marketing solutions will give you the tools to marketing using websites like Facebook, Twitter, LinkedIn, Google+,Pinterest, and blogs. We will optimize the graphic design to match the feel and mission of your company, descriptions, locations and business information. You can then start to manage the sites at your own convenience. We specialize in all aspects on internet marketing and places a high value in an online presence. Social Media plays a key role in marketing your business on the internet. We understand the ever changing updates and the amount of time it takes to stay current on social media. With one of our three easy monthly management packages, you will be able to focus on your business, while we makes status updates and interacts on your behalf to keep you connected to your clients. We know it’s important to a business owner to see what their return on investment is when working with a new service. That is why we include monthly reports and weekly email or phone consultations to show you where your sites have improved and received engagement and to discuss what content is working and what content needs improvement. These worry-free solutions lets us create and manage your company’s Facebook, Twitter, LinkedIn, Google, or Pinterest for you with special attention to the branding and management of the sites. Our social media team will outline metrics of success that accurately measure our goals for each social media outlet in this package. Want to keep your website content current and post a new blog weekly, but don’t have the time to write one? We can save you time with our monthly blogging packages that will allow for you to connect with your clients by offering them valuable blog posts about your business and industry. Each blog will have content specifically tailored for you. Theses posts will provide useful and eye catching content for your website and social media sites giving your business more online exposure.